The Spanish came to the New World during the time of the Spanish Inquisition. They brought that religious fervor, spiritual arrogance and social barbarism with them. After more than 100 years of inflicting that cruelty on the indigenous inhabitants, the Pueblo Revolt of 1680 had to happen. Throughout that time period the natives were forbidden, on pain of death, to practice any aspect of their traditional religions. For many Native Americans, the situation deteriorated steadily until a medicine man from San Juan Pueblo was able to get the tribes to cooperate with each other and face the Spanish: their common enemy. The Rio Grande Valley of northern New Mexico has been occupied by humans for more than 10,000 years. The earliest inhabitants were nomadic hunter-gatherers, living off the land as they traveled across it with the seasons. Then a trader from Mexico brought seeds and taught some people basic farming technology about 4,000 years ago. Slowly, that information and technology spread and was adopted/adapted: the people learned to farm. But farming required staying in one location and primitive villages began to appear. Men began to spend more time farming than hunting and women spent less time gathering berries than grinding seeds. Society began to evolve and organize. Spirituality became organized religion with the religions all surrounding a common theme of living in harmony with each other, with the land and with the seasons. In those days, life was peaceful except when other tribes came to raid. The worst raiders were the Apaches and the Navajos. They were relative newcomers, nomadic hunter-gatherers who migrated in from the north and had no interest in farming except to steal its results. They did know enough that when they raided a farming village, they didn't kill everyone: they left enough people to ensure there would be crops to steal again next year. The raiders were a dangerous nuisance but the situation wasn't so bad that the separate pueblos would band together to fight them. The Puebloan peoples spoke (and still speak) seven distinct languages. Although each is mutually unintelligible to the others, Tewa, Towa, Tiwa, and Piro all have their roots in the ancient Tanoan tongue. The other three languages are Zuni, Hopi and Keres and each is unrelated to any of the others. In spite of the language differences, life, religion, food, clothing, weaponry, tools, etc., among the different tribes was very similar. And they all treasured their freedom to be themselves. Then came the Spaniards. The Apaches and Navajos were a serious problem, but they came, they stole and then they left. The Spanish kept coming and coming and coming and their objective was apparently to steal everything, including the land. To help in this, the Spanish hired the Apaches to grab captives from other tribes and sell them as slaves in Mexico. The Apaches were paid with guns, powder, shot, steel knives and swords. This allowed the Apaches to make more efficient raids on the villagers, especially when the villagers were armed only with stone-age weapons. 1598 saw the first Spanish settlers arrive in the company of Don Juan de Oñaté. The previous Spanish visitors had clearly been gold-diggers but the settlers were more insidious. Under Spanish law, they could force the Indians to work for them. In some cases they forced the Indians off their land and then required them to pay taxes on what they were allowed to keep. There weren't many actual Spanish soldiers but many of the Spanish farmers performed nominal military service and were given the rights to certain properties in return and the "right" to have Indians work the land for them. Essentially, a feudal system was in place with the Spaniards as the overseers and the Indians as the peasants and slaves. Along with the settlers came the Franciscans, missionaries who diligently tried to destroy all vestiges of Indian religion and supplant it with superior "Christianity". 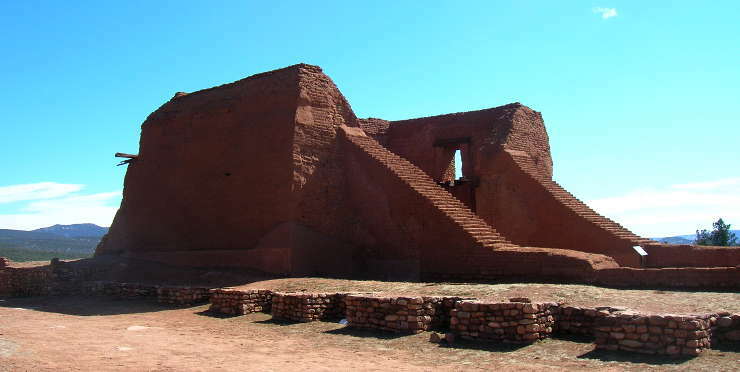 By 1680 Indian slaves had been used to build at least 40 Spanish missions in northern New Mexico. And by 1680 almost every Pueblo Indian in New Mexico was working for some Spaniard somewhere for no pay. There was rebellion over the years. In 1598 the people of Acoma ambushed a group of Spanish settlers and killed 11 of them, one of them a nephew of Don Juan de Oñaté. The Spaniards retaliated by attacking Acoma and destroying nearly the entire village. They also killed about 600 people and took about 500 others into slavery after cutting their right feet off (after "offering" them a chance to become "Christians," of course). The Zuni also killed a couple pushy priests before retreating to their mountaintop fortress in 1630. There was a revolt planned between the Navajo and the Jemez in 1645 but after the first Spaniard was killed, the Spanish military moved quickly. 29 villagers were executed, many others were whipped and still others were sold into slavery before it was over. Another abortive effort in 1650 got nine more men hanged and many more sold into slavery. In 1661 the head Franciscan priest in Santa Fe gave orders to the Spaniards to immediately destroy any and all Indian religious objects they came across. This pushed the Indians still closer to the breaking point. Come 1670 and there was a severe drought in the countryside. Because of years of punishing Spanish taxation, the tribes had nothing stored up and many of their people died of hunger that year. The next year brought an epidemic (possibly anthrax) that affected both cattle and people. The following year was supposed to bring the supply wagon train to Santa Fe from Mexico City and Chihuahua. In a normal year, it took the supply train about six months to lumber over the 1,500 miles of the Camino Real between Mexico City and Santa Fe. The wagon loads were huge and it sometimes took up to 16 oxen and mules to move a single wagon in particular spots along the way. Once the supply train reached Santa Fe, it took several months to load up again with hides tanned by the Indians, cloth woven by the Indians, salt collected by the Indians, and one more thing: Indian slaves for the slave market in Mexico City. Once it was determined everything was loaded and ready, the supply train would begin its journey back to Chihuahua and Mexico City, the centers of Spanish civilization in the New World. While the supply train was important to all Spanish settlers in New Mexico, the supply train of 1680 was of extreme importance to the Pueblo Indians. 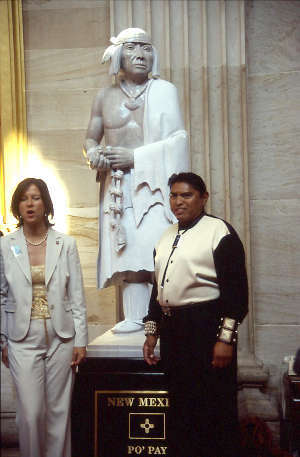 A medicine man from San Juan Pueblo named Popé is widely credited as being the architect of the Pueblo Revolt. All he did was convince the people of the pueblos that the differences between them were really minimal and their common enemy was the Spanish. If the pueblos didn't unite in the face of the mounting Spanish threat, then the Spanish would soon kill them all. It took several years of diplomacy and much careful planning but the pueblos did achieve enough unity for a long enough period of time to be able chase the Spanish from northern New Mexico completely for several years. One of the first things the pueblos had to do was identify and remove any potential traitors from among their own people. This process began with the killing of Popé's son-in-law and several other local tribal officials who had derived their "power" from the Spanish. The tribal plotters also had to keep real knowledge of the plan extremely limited. Even with all their precautions there were rumors circulating and the Spanish Secretary of War for all New Mexico directly warned Popé to stop his activities or face severe punishment. After hearing this, Popé moved from San Juan to Taos Pueblo. As there were far fewer Spanish in Taos than in San Juan, Popé was more free to speak his mind in Taos and his revolutionary work went much faster there. He called together other pueblo medicine men and tribal leaders and slowly they developed a plan. One element of the plan involved recruiting the Apaches in the fight against the Spanish. Another element required planning the revolt for a time when the Spanish would be weakest: just before the 1680 supply train would arrive. They watched the weather, checked the mountain snowpack and measured water flow in the Rio Grande. That helped them pick a date in the second week of August as potentially the most auspicious for the uprising. Knowing they couldn't begin something like this without being able to fully trust all their people, they sent runners to all the villages with a message setting August 13 as the date for the uprising. The Spanish-appointed tuyo at San Cristobal Pueblo (in the Galisteo Basin) betrayed them to the Spanish and the runners were caught, interrogated and killed. However, the Spanish believed that date was real and that they had 4 days to prepare for the revolt. However, the real date set by Popé and his compatriots was August 10, the day after the runners were sent out. With that misleading information, the Spanish didn't really have a chance. With more than eighty years of constantly building rage behind them, the Indians made short work of most of their objectives on August 10, 1680. The attacks began all over northern New Mexico at dawn. In most places, the Indians killed everyone of even half Spanish descent, then took whatever they wanted from those Spaniard-owned homes and farms and burned everything else, including the mission churches. All day and into the evening, frightened Spanish refugees arrived at the garrison in Santa Fe with stories of savage murders happening everywhere around them. Everyone with any Spanish blood in them wanted to hide behind the walls and thick gates of the government compound. Among them were rebel spies, there to learn what they could of Spanish plans and spread rumors. More than a thousand people had gathered behind the government walls by nightfall that day. Among the stories being spread were several in which all the Spaniards from north of Santa Fe to as far south as Isleta had been killed. 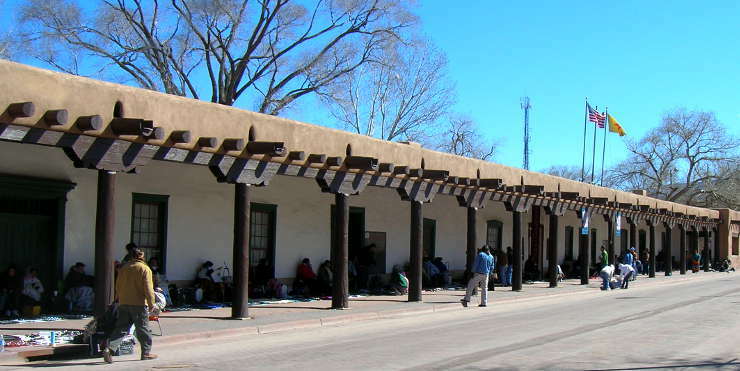 The only Spaniards left alive in New Mexico were those behind the walls in Santa Fe. The rumors gained credence when the Lieutenant Governor's dispatch from Isleta was intercepted, leading the Spanish Governor in Santa Fe to truly believe that he was cut off from help. At the same time, the rumor was being spread in Isleta that all the Spanish in Santa Fe were dead and Indian warriors were headed for Isleta next. Between the two stories, the garrison in Santa Fe and that in Isleta chose not to try to help each other. A mass of warriors arrived at the southern edge of Santa Fe on August 13. At their head was a man named Juan, formerly the Governor's private servant. Juan rode into the capitol to negotiate with the Spanish Governor, General to General. The Spaniard was highly offended and furiously ordered Juan to take his rag-tag army and go away quietly. Juan went back to his warriors and they waited. The next day, a mass of warriors from the north arrived just outside Santa Fe. The attack on Santa Fe began the next day with warriors pushing their way into town from north and south. About 2,500 warriors took part in this assault and, for most of it, the fighting was hand-to-hand, building to building. At one point, the only thing separating the two sides were the massive oak doors on the chapel. The Indians tried to burn those doors several times but never could get through them. Every Spaniard in the city would most likely have been dead before nightfall if the Indians had gotten through those doors. So they tried another tack: using Spanish shovels and hoes, the Indians dug a ditch that diverted the water flow that fed into the government compound. A couple days later, the Governor surprised the warriors by leading a surprise sortie through the front gates of the Governor's Palace. They were caught completely by surprise and many of the warriors were ridden down by cavalry horses as they tried to escape the charges. Then the soldiers set some of the nearby homes on fire. The fire spread from building to building easily and, before it was over, another 300 Indians died among the flames. In all the events of the revolt, this one day in Santa Fe was where the Puebloans suffered their greatest losses. As the fire was spreading, soldiers were capturing people as they ran out of the burning buildings and they returned inside the walls of the government compound with these prisoners and with several barrels of desperately needed water. As the Governor questioned the prisoners he heard story after story of Spaniards being killed everywhere. When he was finished listening, the Governor ordered all 47 prisoners taken out into the plaza and executed. That night the surrounding Indian warriors burned every structure still standing outside the government compound. At that point the Spanish leaders agreed the best thing for them to do was to go out and meet the long-expected supply train from Mexico City. On Monday, August 21, 1680, the gates to the government compound opened and about 1,000 people (many were slaves, many more were servants) marched out. The surviving wounded were carried on two ox-drawn wagons along with the governor's records and personal valuables. There were also about 400 starving and dehydrated horses and oxen in the crowd, all carrying people or goods. Everyone expected to be massacred as soon as they were clear of the gates. Instead, the warriors waiting outside let them go. The revolutionaries were so happy to see the Spanish walk away that they allowed them to leave in peace. Bands of warriors followed the Spanish south to make sure they kept going but not one more native life was risked fighting for their freedom. As the Spanish retreated south, contingents of natives from Isleta Pueblo and from the Piro pueblos in the vicinity of Socorro joined the mass of people headed south. Once they had crossed into the area now known as the Jornada del Muerto the Puebloans headed back north, stopping only to loot and burn the Piro and Isleta Pueblos as they went. The Puebloans had won, for the moment. After the Spanish were gone, the people of each Pueblo went about gathering up their dead and giving them proper burials. For the first time in many years they were able to practice their native religions in public. They began to recognize themselves as people again. It didn't take long after the Spanish were gone for their perceived need for unity to disappear, too. For the most part, each village returned to its relative isolation and the squabbling among neighbors began again. Popé and the other medicine men knew the Spanish would come back but over the next few years, they were unable to convince their people of that. Popé died in 1688 and his wisdom died with him. He was buried with the fullest of honors but he wasn't there to help his people when they next needed it most: in 1692 when the Spanish came back. In 1692 the King of Spain sent Don Diego de Vargas to Chihuahua with a military commission to retake New Mexico. De Vargas also carried a letter of introduction to the Governor of Chihuahua asking for his assistance in that endeavor. The Governor of Chihuahua informed de Vargas the only potential "soldiers" he could spare for a venture into New Mexico were prisoners in the Governor's jails. De Vargas investigated as best he could and then took the Governor up on his offer. So the Conquistadors who made up the Spanish "army" that retook New Mexico were originally condemned prisoners, prisoners who were told they'd be shot on sight if they ever returned to Chihuahua. That gave the prisoners great incentive to be successful in their mission. Well outside the gates of Chihuahua the Governor's dragoons delivered several wagon loads of old and used weapons to de Vargas and company and then the Conquistadors began their march north into history. Reconquering New Mexico turned out to be simple. The Pueblos had all fallen out with each other and the centuries-old jealousies and bickering among them had taken over again. As primarily agrarian societies, they didn't have a warrior class and couldn't properly defend themselves. In addition, individuals from certain pueblos worked with the Spanish to help them retake other Pueblos by sharing their knowledge of back doors, defensive strategies, etc. Once the Spanish settled back into northern New Mexico, they went about some things differently. Even the missionaries acted differently as the Franciscans were mostly out and the Jesuits in. Many Puebloans returned to practice Mass but at the same time they were allowed to be openly involved in kiva ceremonies and public sacred dances. The Spanish never again tried to force the villagers to change their religion. The Spanish also made another new rule: people not of Spanish blood were not allowed to own (or carry) Spanish weapons, nor were they allowed to own or ride horses or mules. Slaves also had to come from tribes that were clearly not under the rule of the King of Spain. In the end, it was as though the Pueblo Indians and the invading Spaniards reached a compromise that was more respectful of the Indians and allowed for a more peaceful and possibly prosperous settlement of northern New Mexico. That compromise held until 1821 when the Mexican Revolution changed everything again. The Mexicans won and forced the Spanish to abandon the area. Over the next several years the increasingly paranoid Mexican government forced more and more people of Spanish descent out of the New World and in that process, they forced virtually all priests of European birth out with them (one of the first groups of travelers to cross the Santa Fe Trail headed east carried six Spaniards with them, one a woman, all ostensibly on their way back to Europe although most were soon settled in the St. Louis area). The Mexican territories were thrown into chaos with the collapse of Spanish feudalism and its religious sub-trappings. Northern New Mexico and southern Colorado saw the rise of Los Hermanos Penitentes as local people acted to fill the religious (and civic) void created by the on-going expulsion of Spanish citizens (and priests). The next big shock the pueblos faced came with the Mexican-American War in 1846-1848... but that's another story. The materials we have now that record the events being recounted above are Spanish in origin and are somewhat suspect as there is evidence the Spanish authorities kept records that did not tell of their worst atrocities and that placed nearly all the blame for the uprising on the pueblo "savages". Franklin Folsom published Red Power on the Rio Grande: The Native American Revolution of 1680 in 1973 as an examination of the Spanish records from the Pueblo Indian perspective and he arrives at what is probably the most close-to-true narrative of what really happened. I highly recommend it to anyone who is truly interested in learning a bit about the "other" side.